Every choice is a straightforward expression of free will - the advantage that differentiates us, humans, from animals and allows to shape our lives. But apart from it, choice imposes responsibility and requires sacrifice - choosing a thing means giving up another one. And that’s where the problem lays. One of the famous studies regarding the problem of choice was conducted by Sheena Iyengar from Columbia University. Over the period of two Saturdays, she and her team have set up tables laden with jams offering samples of either 6 or 24 different flavors to the people passing by. As the result, 3% of shoppers purchased jam when confronted with 24 varieties, while 30% purchased when given only 6. 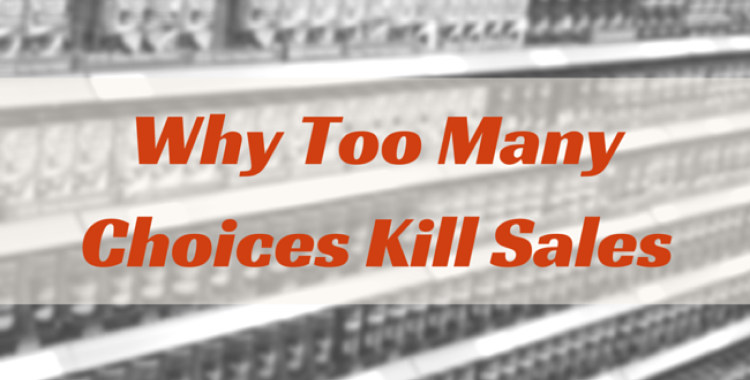 Thus, contrary to a widespread belief, too many choices are bad for sales. Though about 20% customers more got attracted to a 24-jam-flavor-stand, the variety of options placed a shadow of doubt in their minds and led to fewer sales. Due to lots of exotic flavor alternatives, the choice got difficult: should they try something new or stick to their usual pick, buy a few bottles or just the one they intended to originally? As any other serious mental activity, making a choice causes fatigue. And while some decisions are crucial, influential and cannot be ignored, we subconsciously try to economize energy spending when faced with choices of a less serious matter. The need to purchase a jam, for example, is rarely urgent enough to spend a sufficient amount of mental capacities, and so when the choice gets harder, our mind seeks shortcuts. With an intention to save willpower, some people consciously pare down amount of decisions they make, just as former Apple CEO Steve Jobs did. How can we tell? Look at the outfits he’s been wearing for the 95% of time of his public appearances - it has barely changed throughout years. Just because he had way more important decisions to make instead. Unless a customer visiting your e-store is strongly predetermined about his or hers purchase decision, the choice overload can be a reason to postpone an order… And never submit it afterwards. So, the bad news - you might lose sales by offering too many options; the good news - you’re in power to make choosing easier. There are several actionable ways to make the buying process a bit more simplified and straightforward. Yes, you’ve read it right - offer less to sell more. The trick is to find the happy medium between leaving customers no choice at all and tapping them into an endless range of products. It might be challenging, but as soon as you find the sweet spot, you’ll feel the difference. Fun fact: when Head & Shoulders shampoo line was cut from 26 products to 15, the manufacturer (P&G) saw a 10% increase in sales. Amazing, but true. Though slimming down the product range is an effective way to ease the choice, such radical measure is not always possible or justified. In this case, simply put products with high demand prior to less popular, hiding last ones on 2nd/3rd/4th category pages. As the result, rarely bought products will not cause a distraction on the way to making a clear, doubtless decision. People need to realize consequences associated with each of their choices. Knowing the exact differences between the products considerably eases the process of making a decision. For example, how would you choose between a nail polish described as “glamorous pink” and a “royal pink” one? Apple is a wonderful illustration of how to differentiate products rightly. The company describes each of their macs in a single, comprehensible sentence - just enough to distinguish their main features and make the choice easy. Steve Jobs said “A lot of times, people don’t know what they want until you show it to them”. So, what if a customer visits your website without a smallest idea of what he or she wants? Such a case can be addressed by making a product suggestion right up to face - “This is good, try it out”. Featured products is a well-known technique used by a vast majority of e-Commerce sites aimed to influence the course of a customer’s action. Though such an advice basically broadens the range of products displayed to a customer, which goes contrary to the first point of our list, clearly suggested items do not have any emotional effect. Whilst determined shoppers are likely to consider it as yet another promotional feat, “passers-by” will perceive this as a call to action. Amazon went far in making cross-sell and upsell suggestions that account nearly for 30% of its total revenue. Product sections entitled like “what other customers are looking at right now” and “‘people like you bought” effectively appeal to our herd instinct and withdraws the need of marking a thought out choice. At this point, you get it. Choice is hard. And though there are some decisions that will never be easy, your aim is to encourage customers to buy more and decide less. After all, most of purchase choices are made impulsively, so a right set up and wisely tailored shopping experience is enough to free your customers from a burden of choice.